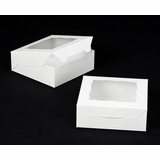 Buy Mini Cupcake Boxes & Inserts to Keep Your Petite Eats Neat! We make all kinds of bakery and cupcake boxes. 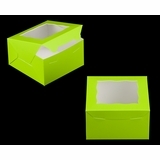 This page, however, is dedicated to your daintiest cupcake delicacy - the mini cupcake. 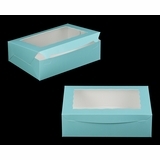 The mini cupcake inserts you see below come in two styles: standard mini and *skinny* mini. With inspiration comes variation and we know not all mini cupcakes are baked the same. 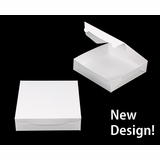 We designed the Skinny Mini cupcake inserts to secure a smaller mini for those of you who make your minis even more petite. 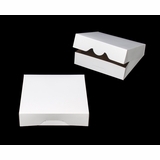 If you aren't sure which mini cupcake insert is right for you, please visit our samples page and get your frosted fingers on both styles so you can dare to compare. 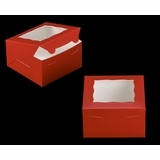 The mini cupcake inserts fit the mini cupcake boxes perfectly and prevent your minute morsels from mashing into one another. 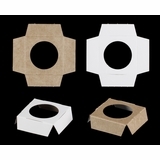 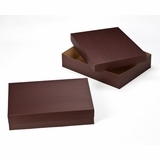 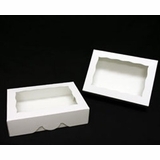 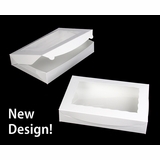 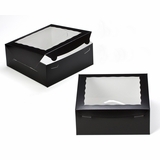 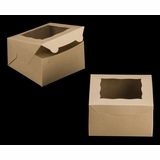 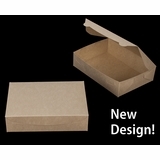 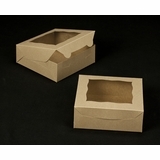 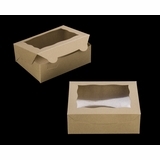 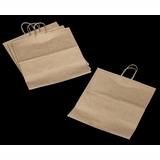 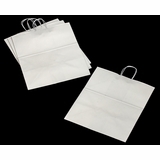 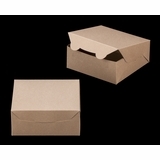 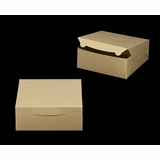 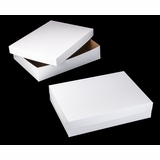 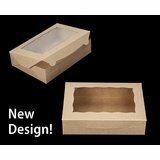 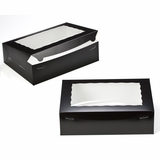 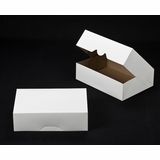 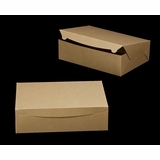 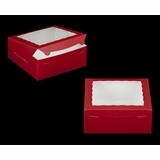 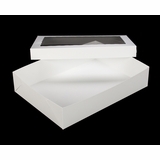 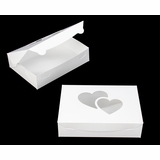 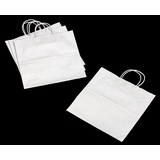 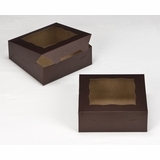 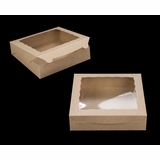 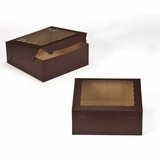 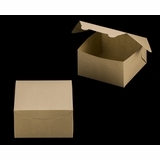 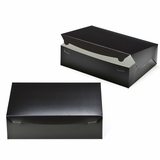 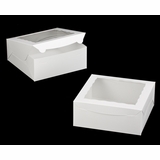 This Single Standard Mini & Skinny Mini Inserts are tailored to fit boxes listed just below. 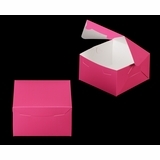 The perfect sized mini cupcake box requires the perfect sized mini cupcake insert. 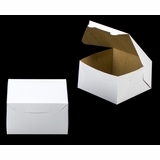 The cupcake packaging elements you see here are literally made for each other, by us, inside of your Box Shop. 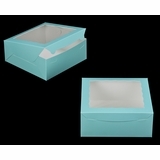 Because minis are so little, their delicious appeal can be lost in a box made for bigger cupcakes. 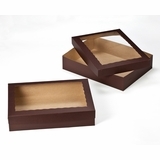 These holders and boxes are just right. 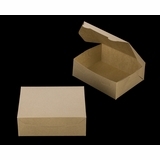 Skinny mini cupcake inserts were inspired by creators of morstles most miniature. 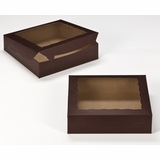 These cupcake inserts are shorter than the standard mini cupcake holder and the cubby hole is a tad smaller to make a snug fit for the tiniest of your frosted sweets. Your tiny cupcake seen through the window of a tailored single mini cupcake box encapsulates a cuteness beyond words. 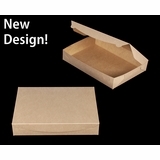 Please, if nothing else, get some samples to see for yourself that these words are true! 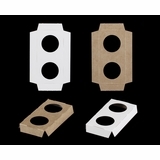 2775 - 2 1/2" x 2 1/2" x 2 1/2"
2286 - 2 1/2" x 2 1/2" x 2 1/2"
3371 - 2 1/2" x 2 1/2" x 2 1/2"
2287 - 2 1/2" x 2 1/2" x 2 1/2"
The Two Count Standard Mini & Skinny Mini, fit the boxes listed below them. 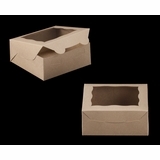 This cardboard, paired with one of the two count tailored miniature cupcake boxes below has the power to make a cupcake lover smile. 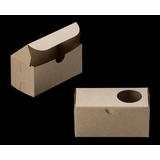 To say that it�s magic crosses the corny line, but a couple of miniature cupcakes on display using these cupcake supplies is more than the sum of its parts. 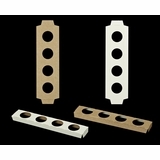 Please, do yourself a favor, grab some samples from our Samples Page, and see for yourself. 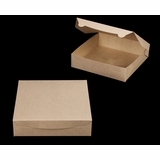 Picture two cupcakes, little even by mini cupcake standards, finding a chic home in packaging that not only protects, but elevates the presentation of your minis to "professional" within the mind's eye of cupcake fans who look upon the wonder of your frosted artistry knowing that, after they eat that first one, they get to enjoy the experience all over again. 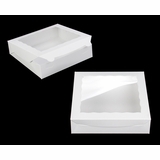 The skinny mini cupcake insert is smaller than a normal mini cupcake holder and perfect for bakers who make minis on the more minuscule side. 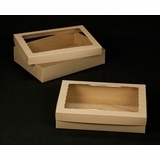 3384 - 5" x 2 1/2" x 2 1/2"
3385 - 5" x 2 1/2" x 2 1/2"
3376 - 5" x 2 1/2" x 2 1/2"
The Four Count Spiky Mini Insert fits the boxes listed below. 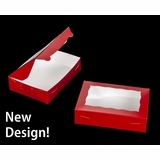 The four count mini cupcake insert gets the spiky treatment! 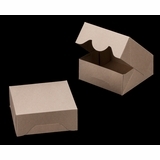 This means those little paperboard spikes hold your minis securely in their little box of yummy treasures even when the box gets bumped a little. 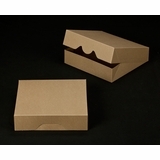 The spikes work so great not only because they keep your minis from going on the move, but because they still allow for your tiny works of deliciousness to be removed from their box with ease. 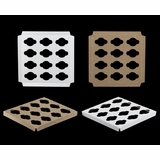 3757 - 6" x 6" x 2 1/2"
2040 - 6" x 6" x 2 1/2"
3228 - 6" x 6" x 2 1/2"
2097 - 6" x 6" x 2 1/2"
3660 - 6" x 6" x 2 1/2"
2367 - 6" x 6" x 2 1/2"
2506 - 6" x 6" x 2 1/2"
3394 - 6" x 6" x 2 1/2"
2108 - 6" x 6" x 2 1/2"
The Four Count Standard Mini & the Skinny Mini, fit the boxes listed below them. 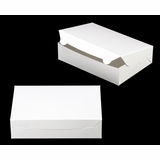 A lot of the customers we get to serve with our cupcake boxes tell us they love our boxes because our packaging makes for a professional presentation. 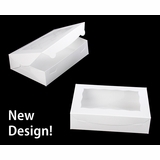 When you use this four count mini cupcake insert and use it with one of the many mini cupcake boxes we specifically designed to work with it, your mini cupcake presentation will have 'presence'. 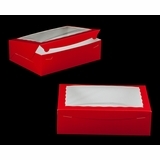 This is because each of your mini cupcakes are held in place with their own little space within the insert. 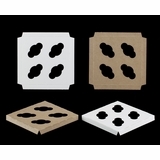 Your mini cupcakes stay evenly separated and this not only looks sharp, it keeps your little frosted works of art from smashing into one another while on their way to lucky mouths. 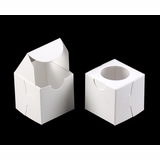 Skinny mini cupcake holders were designed with the help of bakers to provide a system of securing your mini cupcakes that don't fit just right in a standard mini cupcake holder. 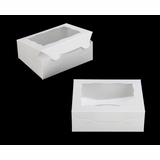 Buy these four count skinny mini cupcake holders along with one of several mini cupcake boxes on the Box Shop, and you will have a tested and trusted way to protect and present your minis, even though they are even more little than some other minis in the world. 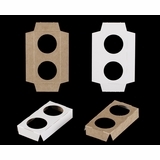 If you aren't sure which mini cupcake holder insert will work best for your mini cupcakes, please visit our Samples page and get your frosted fingers on some and test them out. 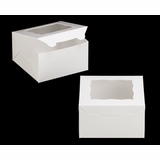 Skinny mini cupcake holders are made to fit mini cupcakes that are a wee bit smaller, but the power of your cupcake presentation will make for big temptation for hungry eyes when they gaze upon your sweet treats. 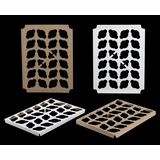 3056 - 7" x 7" x 2 1/2"
3238 - 7" x 7" x 2 1/2"
3272 - 7" x 7" x 2 1/2"
2043 - 7" x 7" x 2 1/2"
3842 - 7" x 7" x 2 1/2"
3843 - 7" x 7" x 2 1/2"
3577 - 7" x 7" x 4"
3580 - 7" x 7" x 4"
3581 - 7" x 7" x 4"
3579 - 7" x 7" x 4"
3582 - 7" x 7" x 4"
3578 - 7" x 7" x 4"
3583 - 7" x 7" x 4"
3584 - 7" x 7" x 4"
3587 - 7" x 7" x 4"
3585 - 7" x 7" x 4"
3586 - 7" x 7" x 4"
3588 - 7" x 7" x 4"
3589 - 7" x 7" x 4"
3590 - 7" x 7" x 4"
The Straight Four Count Mini Insert, Click the item to see the Boxes that these fit. 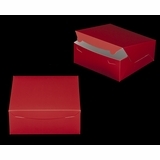 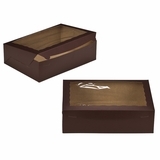 For a list of the boxes that this Insert fits in please visit the item page by clicking here. 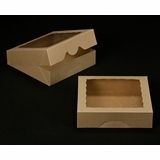 The Half Dozen Spiky Mini Insert fits the boxes listed below. 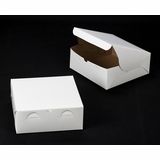 The world is an unpredictable place � even for mini cupcakes. 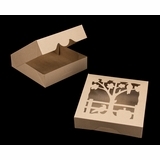 One day, a happy person can be walking out the door with six of your beautiful miniature cupcakes and then POW! 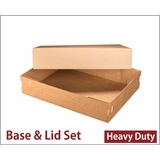 They get bumped in the side by a man wearing an unappealing hat. 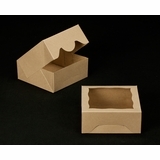 Did the six minis get knocked out of their insert? 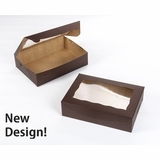 Not if you used the spiky mini cupcake insert they didn�t. 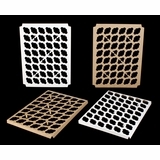 The spikes work like a dream. 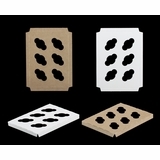 3719 - 7" x 5 1/2" x 2 1/2"
3725 - 7" x 5 1/2" x 2 1/2"
3726 - 7" x 5 1/2" x 2 1/2"
3720 - 7" x 5 1/2" x 2 1/2"
3723 - 7" x 5 1/2" x 2 1/2"
3724 - 7" x 5 1/2" x 2 1/2"
The Half Dozen Standard Mini & the Skinny Mini, fit the boxes listed below them. 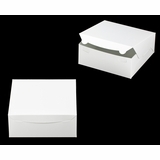 Box your mini cupcakes with a half dozen mini cupcake insert and turn the presentation of your little cupcakes into a big production. 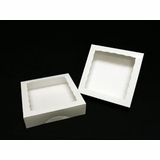 Your six count mini cupcake inserts keep your tiny works of art from toppling over into one another. 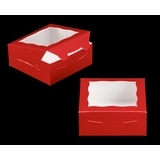 The evenly-spaced mini cupcake receptacles will keep your minis standing proper and proud. 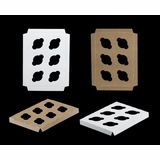 Like all of the cupcake inserts we make, these mini cupcake inserts are reversible. 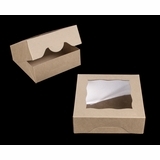 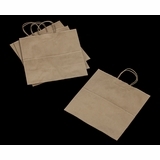 Slip these inside a cupcake box with the brown side on display or with the satiny white side showing. 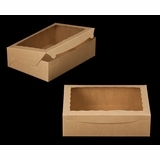 The kraft side looks warm and inviting when paired with our Natural Brown Eco-friendly boxes. 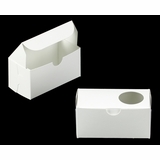 The skinny mini line of cupcake holders are for those of you who create cupcakes that may be a bit too small for our standard mini cupcake inserts. 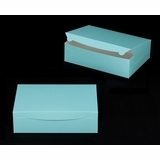 Six mini cupcakes look great when displayed using this holder and one of your favorite BRP cupcake boxes. 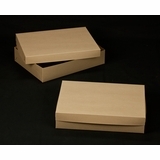 We made the boxes for the holders...and the holders for your littler minis! 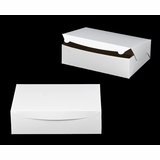 Your mini cupcakes take on an air of importance when people see that each individual mouthwatering treat gets its very own space within its packaging. 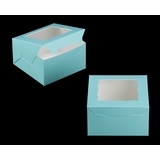 Keep your mini cupcakes looking proud and pristine with your half dozen skinny mini cupcake holder. 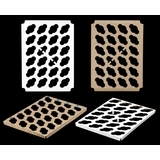 Remember, these reversible skinny mini inserts are made for cupcakes smaller than what will properly fit in our standard mini cupcake holders. 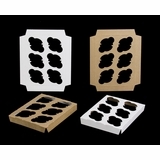 If you aren't sure which cupcake holder is right for your mini, please visit our samples page and test them for yourself. 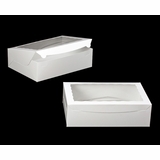 1741 - 10" x 7" x 2 1/2"
2440 - 10" x 7" x 2 1/2"
3479 - 10" x 7" x 2 1/2"
2442 - 10" x 7" x 2 1/2"
3685 - 10" x 7" x 2 1/2"
3239 - 10" x 7" x 2 1/2"
2441 - 10" x 7" x 2 1/2"
2443 - 10" x 7" x 2 1/2"
4024 - 10" x 7" x 2 1/2"
3759 - 10" x 7" x 2 1/2"
4041 - 10" x 7" x 2 1/2"
The One Dozen Spiky Mini Insert fits the boxes listed below. 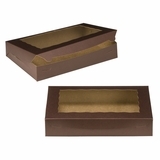 We developed the spiky mini insert because bakers let us know that sometimes people would get their box of minis and almost immediately push up on the bottom of the box sending the minis flying out of the holder and fouling the frosting. 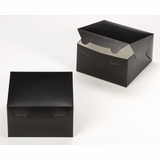 While it is impossible to control the behavior of your customers, we figured out a solution to keep your little sculptures safe even when the box is handled in a less-than-dainty way. 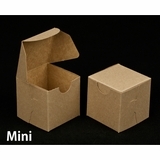 The One Dozen Standard Mini & the Skinny Mini, fit the boxes listed below them. 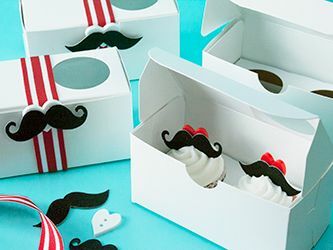 How do you present one dozen mini cupcakes in a way that lets the owners of eager taste buds know that your 12 mini cupcakes are not to be taken lightly? 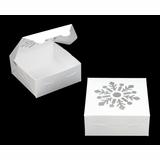 Our one dozen mini cupcake insert displays your carefully crafted confections with a polished professional package that allows your mini works of wonder to get the attention they deserve. 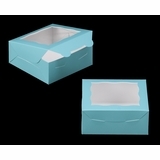 Every important bite-sized cupcake gets its own little mini cupcake space. 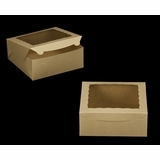 Having each mini snuggled into its own place keeps the frosting kitchen-perfect and unsmooshed by adjacent cupcakes. 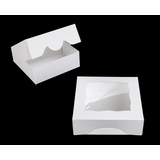 Skinny mini cupcake holders exist to cradle confections that are too small to fit properly in our standard mini cupcake holders. 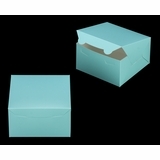 Buy your mini cupcakes these skinny mini one dozen cupcake inserts and keep a twelve pack of your mini miracles presented with poise and pride. 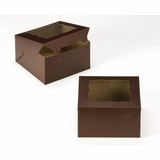 Having a reserved room for each individual mini cupcake means your minis will be prevented from smashing into one another. 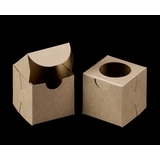 These reversible 12 count skinny mini cupcake holders are custom made to fit inside your favorite BRP mini cupcake boxes. 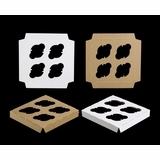 If you aren't sure which mini cupcake insert is right for your cakes, please visit our sample page, test a few, and set the stage for your littler mini cupcakes to shine. 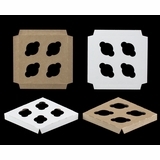 3980 - 10" x 10" x 2 1/2"
2445 - 10" x 10" x 2 1/2"
3979 - 10" x 10" x 2 1/2"
3981 - 10" x 10" x 2 1/2"
3609 - 10" x 10" x 2 1/2"
947 - 10" x 10" x 2 1/2"
3737 - 10" x 10" x 2 1/2"
2242 - 10" x 10" x 2 1/2"
2375 - 10" x 10" x 2 1/2"
1219 - 10" x 10" x 2 1/2"
1892 - 10" x 10 "x 4"
2832 - 10" x 10" x 4"
2833 - 10" x 10" x 4"
2884 - 10" x 10" x 4"
2834 - 10" x 10" x 4"
2885 - 10" x 10" x 4"
810 - 10" x 10" x 4"
2918 - 10" x 10" x 4"
2917 - 10" x 10" x 4"
2107 - 10" x 10" x 4"
2376 - 10" x 10" x 4"
2915 - 10" x 10" x 4"
241- 10" x 10" x 4"
The Two Dozen Standard Mini & the Skinny Mini, fit the boxes listed below them. 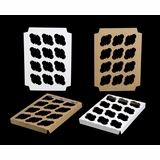 A skinny mini cupcake holder is a cupcake holder designed for miniatures that are too small for our standard mini cupcake holders. 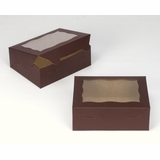 This one holds two dozen of your fastidiously frosted petite sweets. 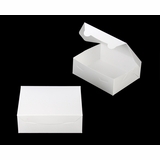 With 24 minis, it could be a challenge to keep them looking as brilliant as when you finished your final touches to their tops. 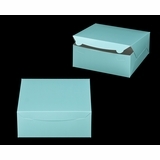 This reversible skinny mini insert provides each pretty little cupcake its own proper little space. 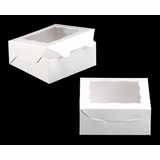 Your smaller minis will stand straight, tall, and tantalizing inside your favorite mini cupcake box when you cradle your creations within this two dozen skinny mini cupcake holder. 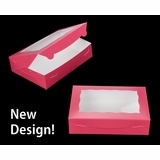 Don't forget, the cupcake holders are reversible. 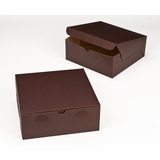 You can show these brown-side up when using our Natural Brown mini cupcake boxes. 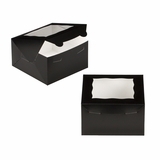 Not sure what mini cupcake holder will best fit your minis? 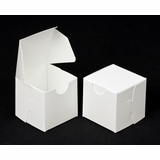 Visit the BRP Box Shop Sample page to try some and see. 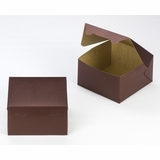 The spiky mini cupcake insert has tiny tabs of tilted paperboard that hold your cupcakes in place even when the cupcake box gets a jolt. 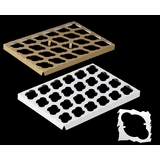 We designed the little spikes to have enough stay-put power to keep your cupcakes steady without making them difficult to remove. 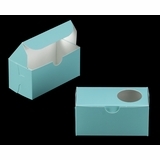 Works even better than we had hoped. 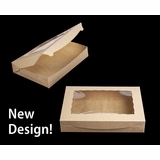 Designed at the request of mini cupcake bakers and tested by quite a few of them too! 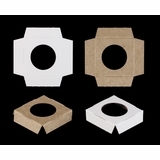 1856 - 14" x 10" x 2 1/2"
3240 - 14" x 10" x 2 1/2"
2421 - 14" x 10" x 2 1/2"
2422 - 14" x 10" x 2 1/2"
2423 - 14" x 10" x 2 1/2"
244 - 14" x 10" x 4"
2873 - 14" x 10" x 4"
2886 - 14" x 10" x 4"
2874 - 14" x 10" x 4"
2887 - 14" x 10" x 4"
2875 - 14" x 10" x 4"
1830 - 14" x 10" x 4"
2924 - 14" x 10" x 4"
2294 - 14" x 10" x 4"
2101 - 14" x 10" x 4"
2378 - 14" x 10" x 4"
3747 - 14" x 10" x 4"
752 - 14" x 10" x 4"
239 - 14" x 10" x 4"
1247 - 14" x 10" x 4"
The Four Dozen Spiky Mini Insert fits the boxes listed below. 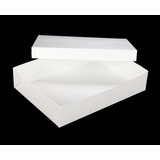 3703x3708 - 19" x 14" x 4"
294x293 - 19" x 14" x 4"
3045x3049 - 19" x 14" x 4"
3045x3048 - 19" x 14" x 4"
2104x2102 - 19" x 14" x 4"
2104x2379 - 19" x 14" x 4"
294x397 - 19" x 14" x 4"
292x291 - 19" x 14" x 4"